New Google Homepage Design – Planning for a New Google? 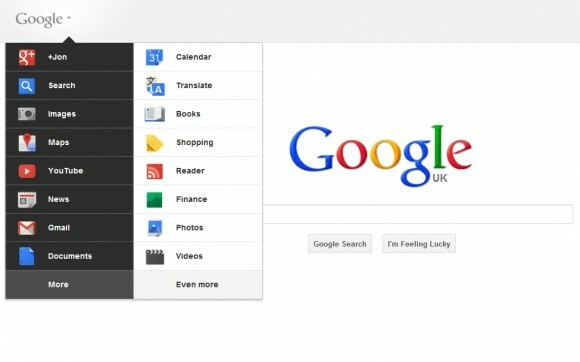 Google have updated their homepage with new drop-down and fly-out menus. Gmail continues to look more like Google+ and even Blogger has had a makeover. The less said about Google Analytics the better, but that and Adsense have also had makeovers this year. Without doubt, this has been the busiest year for Google designers. So, what is the plan? Why are they making so many changes now? The fact that everything is starting to look more like the Google+ style suggests to me that the ultimate plan is simply to unify all the major Google products under one hub – Google+. Why? Well, Google needs Google+ to ensure that it holds major market share. Although Google has the lion’s share of search today, if that is lost it loses much of its business. This has been the major criticism of Google for many years, at least from shareholders and investors. Millions of people use Gmail, Google Docs, Adsense, Adwords and Analytics daily as part of their business and then use Facebook for leisure. What Google are doing (IMHO) are attempting to create a single platform that combines all their products so that users can move from one area (business, email etc.) seamlessly into other new areas (social). This will help Google to slowly encroach on Facebook’s turf and steal some of the market share from under their feet. Google have the users, the users are just focused on working rather than playing. But that is not all they are doing. I have noticed in the last couple of days that we can now sign in to Yahoo products with a Google account. There are some issues, but I did sign into Yahoo’s Contributor Network using my Google account yesterday and noticed that I can also connect my account to Yahoo Answers (although this morning it was broken). What all this is leading to is a general Google friendly Internet that should provide many people with reasons to move away from Facebook. Facebook has been making some attempts to spread its wings, mostly by working with the blogging community with Facebook comments integrated into blogs, but there is far less opportunity for Facebook clients to move around outside of Facebook’s walls at the moment. Google seems to be drawing people in while allowing them to spread their wings and discover new areas.